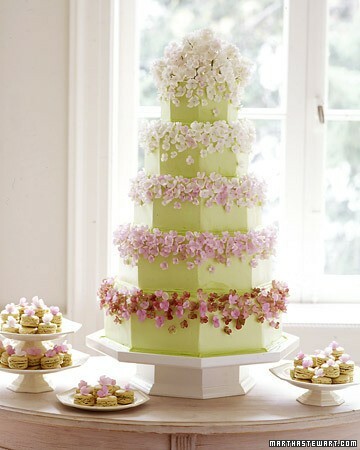 While I’m not a huge fan of the color green, this cake grabbed my attention thanks to its unique hue. It’s more lime green than evergreen but the addition of the sugar hydrangeas makes it perfect. This cake might not fit in your winter wedding reception but if you’re making plans for a spring wedding this would be the ideal cake. Its light and airy color scheme would be gorgeous on a warm spring day! You can find this five-tier creation here.